Daymos v3 Elite Npower & Bundesliga OF Released! We are incredibly honoured to be the first, and (currently) the only website to host this option file. 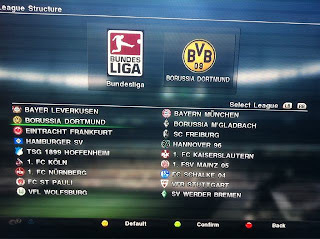 And you'll be pleased to know that the Daymos v3 Elite Npower & Bundesliga option file has been released! Version A will be npower Championship based, while Version B will be Bundesliga based. As you'll probably read in the option file description - and the picture at the top of this post too - you will know that you've got a decision to make. Although real emblems will remain on the kits in-game, due to licensing restrictions on the 360 (thanks again, Microsoft! ), one of the two added leagues will have to have fake emblems on the match menus. "If you select "apply konami changes" then all squads will be reduced to 23 players and you will have to spend hours correcting". Click "no" when you are prompted, to retain the huge squads Daymos has created. Feel free to use our Xbox 360 Editing Tutorial to check on how to import this option file onto your 360 console. Enjoy the file, and be sure to thank Daymos for his tremendous efforts to get this file out to us all.